The Bass1 is the pre-amp from the Bass701 amp in a rack format, with a TON of overdrive on tap and massive flexibility to shape your tone. The pre-amp features a 6 band overdrive section that allows you to carefully tailor the gain, a switchable effects loop, balanced outs and a headphone output with a line in for practicing along with existing music. 6 Band Overdrive: In the overdrive section the instrument signal input level is set by the Pre Gain control and then split into 6 frequency bands covering the entire audio spectrum. The Pre Gain is an easy way to alter the total amount of overdrive across all the bands. Each band goes through it's own, separate overdrive channel with individual Drive and Level controls. Then all the overdrive channels are summed back together into one signal. It's important to note that the overdrive channels are divided by frequency on the input signal and the overdrive on each channel will be applied mostly to that particular frequency band. The harmonics generated on each overdrive channel will go beyond that frequency band and are retained as an integral part of the output tone. The pre gain also affects the output level of the overdrive section. If you turn the pre gain down you increase the overdrive section's output level so that you can still get full volume at lesser gain settings. We've adjusted the gain of the two lower end overdrive units to have more volume but less overdrive to keep the low end tighter but you can still drive them hard at higher gain settings. Effects Loop: The effects loop can be set to come before or after the entire overdrive section for more flexibility. The level of signal sent to the effects loop can also be adjusted. Select Footswitch: Select between Overdrive and Clean with either the included footswitch or the Select toggle switch on the front panel. Master output: A balanced XLR jack for connecting to a power amp. Headphone output: The headphone output now has it's own volume, which is unlabeled on this unit because it was just added. Line In (headphones only): Just added is a 1/8" line in jack with a volume control to allow for a music input such as an ipod or smart phone to be sent to the headphones along with the bass signal. 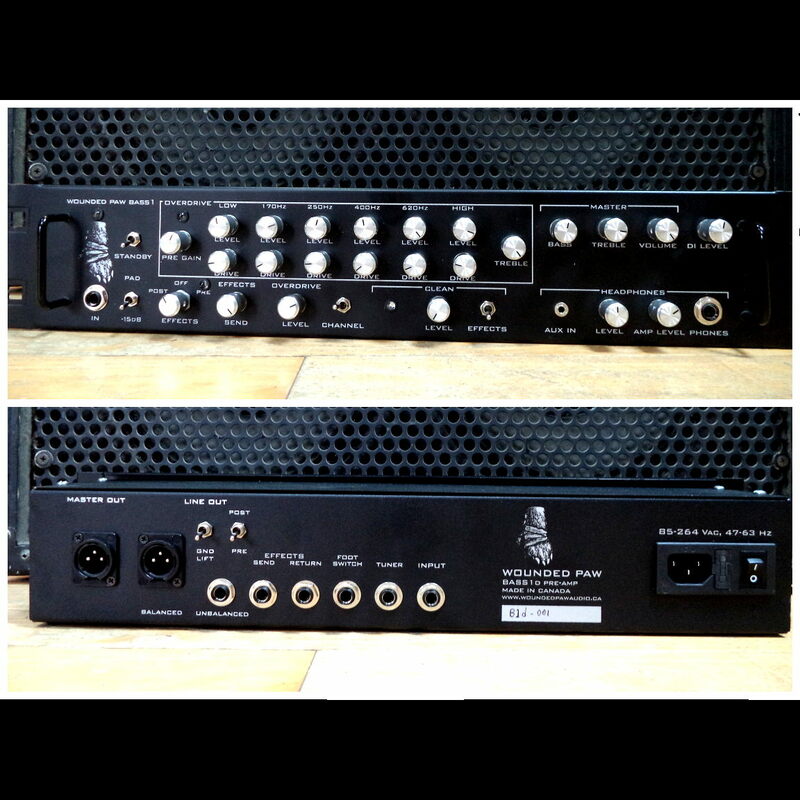 Balanced Line Outputs: A separate level control sets the output volume to the balanced XLR and balanced/unbalanced 1/4” jacks to connect to mixing consoles or other amplifiers. Universal Mains: Can accept 85 to 264 Volts AC, 47 to 63 Hz. 2U size rackmount enclosure (3.5" x 19"), 4" deep. Available with black or silver aluminum knobs. A great blog page and video demo of the amp is now up at The Bunn. And also by the The Bunn, an Audio Demo. Video demo of the Bass701 amp with a guitar! !